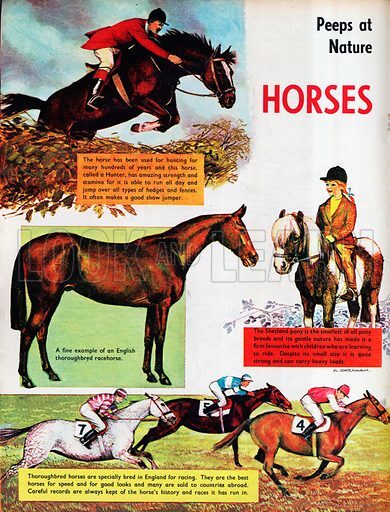 This edited article about racehorses originally appeared in Look and Learn issue number 949 published on 29 March 1980. Moifaa, a thoroughbred racehorse, was being shipped to England to run in the 1904 Grand National when a disaster befell him. His ship was wrecked in a storm off Cape Town. Incredibly the horse, left to his own devices, swam and was carried over 160 kilometres to land. Once he was identified, Moifaa’s owners were told of his marathon swim. He was sent on to England where, despite his strenuous exploits, the horse was still entered for the great race. On 25th March, Moifaa walked down to the starting line an outsider at 25-1. The general belief was that he would not even finish the course. However, that unsinkable shipwrecked horse not only completed the course, he romped home first to achieve one of the most remarkable victories in the history of the Grand National.